An organic farmer in Devon is trying to revive the eating of the part of male cattle and sheep known in the trade as fries, or more commonly as testicles. Mark Bury, who runs Eversfield Manor Farm near Okehampton, says they are a forgotten and delicious delicacy. He says that testicles, which are part of Middle Eastern diets, should be on supermarket shelves. However, he is having trouble even sourcing enough testicles to fulfil demand from his own farm. The farm had an order for a dozen, but it is struggling to find them as most cattle and sheep are castrated while young. One slaughterhouse could supply only four testicles from 200 sheep slaughtered. Mr Bury said: "We are struggling to fill demand. "We'll see how it goes, but I'm considering not castrating our sheep to increase supply." The main aim of promoting testicles was to promote organic farming. He said: "We have been intensively farming to make subsidies for too long. "I say to farmers, 'Wake up to some marketing and put UK products at the front of the agenda'. "To do that you have to be a bit creative." He is confident testicles will survive any taste test. "I had a few friends over to try some lamb's testicles," he said. "I didn't tell them what it was, but they did taste fantastic and I do think that people are missing out." He added: "The only person that wouldn't eat them was my 14-year-old son who was the poor chap who had to prepare them. "Taking the skins off them isn't a particularly pleasant job." 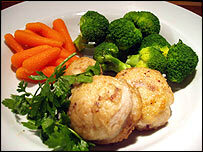 He recommends lamb's testicles, covered in breadcrumbs and fried in butter and sunflower oil. 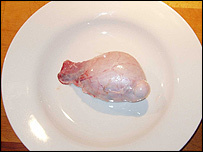 Food writer Hugh Fearnley-Whittingstall says they are a bit bland, but says testicles have other attractions. He said: "It is a gesture of respect to animals that we kill for food that we use every part of them. "It is a holistic approach that I think is very much in tune with organic farming." He said trying to get testicles into people's shopping bags may be a step too far. "One step at a time. I am rather passionate about trying to get tripe back on the menu at the moment and sheep's brains. "But you will find testicles on sale at many butcher's shops serving the Middle Eastern community. "We can learn a lot from them on how best to use these dishes."